My sister and I tend to get dry flaky skin year round and I've been looking for a good moisturizing face product to help. As I started my Christmas shopping today I decided to check out Lush I haven't bought anything in a long time and I had run out of my toner and I wanted to try something new. 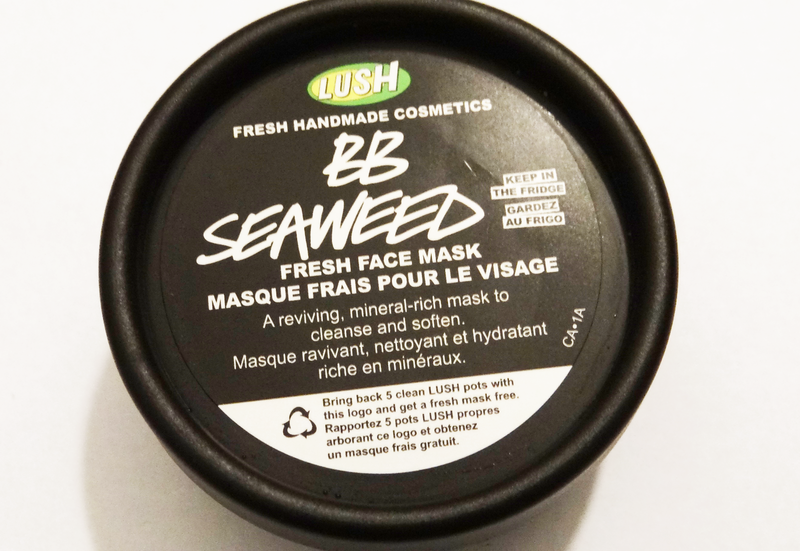 I picked up this BB Seaweed($6.95 CDN) face mask. Redness inducing, inflammation causing… even painful! 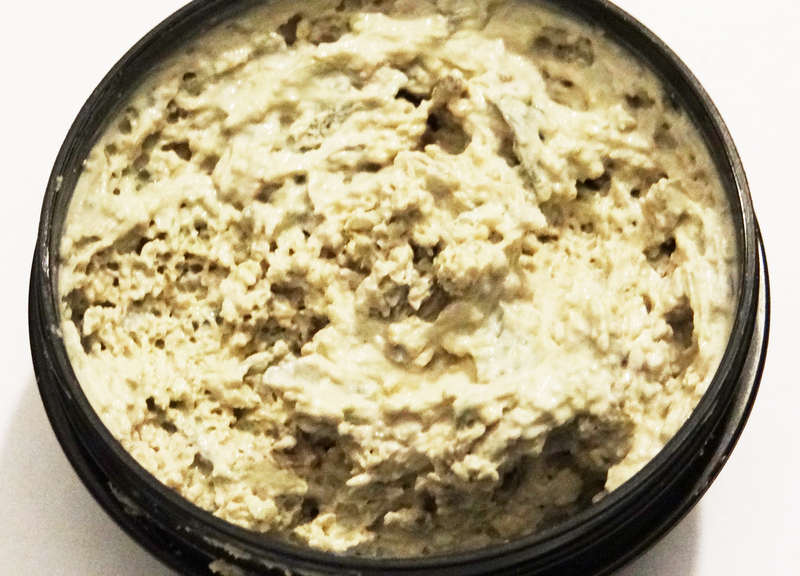 BB Seaweed is a best-seller for its ability turn every rough patch into smooth, supple skin. 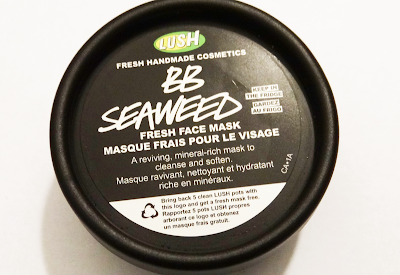 No surprises here, BB Seaweed is packed full of none other than the ocean greenery itself! Seven pounds of it in each batch, in fact. Finely ground almonds gently slough away dry skin, rose absolute balances skin tone and organic extra virgin olive oil moisturizes. Slather up in seaweed and feel your skin smile. I've heard that this mask is really good for dry skin. I was also recommended the Oatifix so I might try that if this doesn't work. The smell of this is hard to explain, but it reminds me of the ocean and being by water. This facial mask is very chunky. I've never used anything like this and I found that because it was so chunky it was hard to spread around my face. The cold felt good on my skin, since it has to be refrigerated. Like most masks I could feel it start to tighten up so I wasn't able to move my face much. One thing I found unusually is that I don't have problems with masks that feel tightening but this one started to give me a slight headache. It wasn't a bad headache but my forehead just started to hurt a bit. Washing it off was hard. On the website it says not to let the whole mask dry fully. I waited 10 minutes and found it hard to wash because the chunks would fall off and it was hard to get some parts because of the chunks. Once I took it all off I did find my face very soft, and it took care of my dry patches. I did end up with a pimple, I'm not sure why. I ended up trying this mask again without putting it on my forehead, and I still got a slight headache I don't know if it's from the smell of the facial mask. Overall I like the smell of this mask, and the softness is leaves your skin feeling. I wouldn't like to use this mask again due to the headache it gave me while it was on my face, and I don't like how chunky is it. I wish it was smaller chunks. Have you tried this facial mask? What did you think?